The latest Humble Mobile Bundle has been live for a week, and you know what that means. Yes, more games. This is a board game bundle that already included such favorites as Catan and Ticket To Ride. Now you get three more games for one reasonable price. You can also get a chance to win the bundle free right here. This is a three-tier bundle with $1, $3, and $5 cutoffs. The new games are part of the $3 level. So you get the new titles as long as you pay $3 or more. That's true if you already bought in or if you're planning to do so in the next week. The new games are Take It Easy, Small World 2, and Ingenious. As usual, all the games are available for direct download and DRM-free. You can choose the amount of your purchase, and decide how much goes to developers, charity, and Humble Bundle. If you want to try and win the full bundle free, here's how it works. 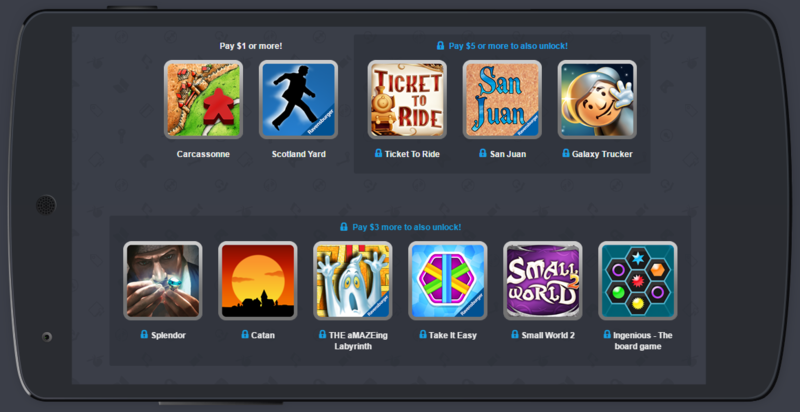 To win one of 10 free codes for the full Humble Mobile Bundle 21, just leave a comment below. We'll select the winners tomorrow, November 15th. Good luck!